The Artesia Historical Museum and Art Center is proud to display “Underground of Enchantment” June 21 – Aug. 31. 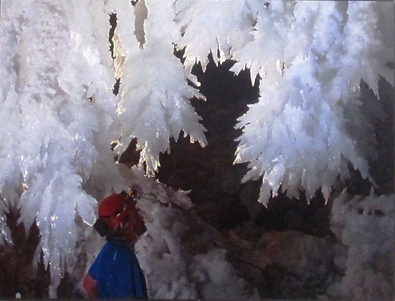 The exhibit features stunning photographic images of Lechuguilla Cave, including 3D versions! There is also a hands-on table with local rocks and minerals for visitors to explore. Lechuguilla Cave, near Carlsbad Caverns, is considered one of the most beautiful caves in the world — but it’s not open to the public. It was discovered in 1986 when some cavers decided to explore the bottom of a pit known as Misery Hole, and they realized that they had discovered the entrance to another large cave system. To enter Lechuguilla Cave, explorers must travel 118 feet straight down by rope. Scientists have discovered organisms living in Lechuguilla Cave that are not found anywhere else in the world. This cave is quite rare in that its formations have been formed by sulfuric acid solutions, and a team from NASA has studied the living micro-creatures deep inside the cave to learn how life has adapted to the complete lack of sunlight and the sulfurous climate, believed to be similar to the conditions under Mars’ surface crust. 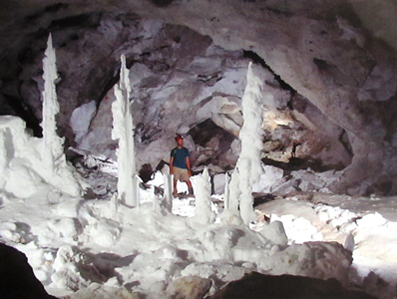 “Underground of Enchantment” allows visitors to view the fabulous formations in Lechuguilla Cave without having to rappel 118 feet underground. The large color photographs show each feature in great detail, and the accompanying 3D viewers add depth to the images. The exhibit is on loan from the Carlsbad Museum and Art Center and will be available for public viewing during regular museum hours: 9 a.m. – noon and 1-5 p.m. Tuesday-Friday, and 1-5 p.m. Saturdays. Call 748-2390 for more information; tours and after-hours visits are available by appointment.